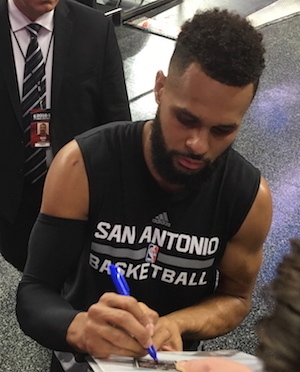 Lance Martinez from My Detroit Sports sends along this photo of San Antonio Spurs guard Patty Mills signing autographs, during the Spurs final visit to The Palace of Auburn Hills, earlier this season. Mills grew up in the Australian capital city of Canberra, before playing his college ball at St. Mary’s. Mills has represented his native land in each of the last three Summer Olympics. After being selected by the Blazers in the 2009 draft, Mills bounced around a bit, eventually arriving in San Antonio during the 2012 season. His 5-year run with the Spurs has included being a part of the club’s 2014 NBA Finals victory over LeBron James and the Heat. This season, the 28-year-old is averaging 9.8 points, 3.5 assists (career high) and 1.8 rebounds a game, in 22 minutes of action (career high). Spurs fans can check out more behind the scenes looks at the highly successful franchise, courtesy of this link.